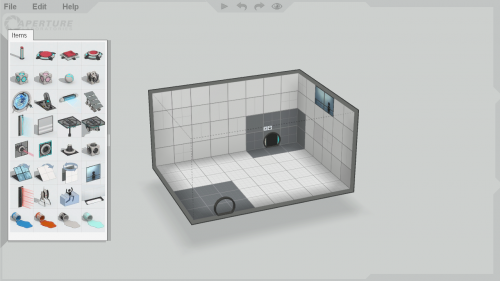 The Puzzle Creator (also known as Puzzle Maker or Editor) is a part of the Perpetual Testing Initiative in Portal 2, a DLC released on May 8th, 2012 allowing the creation of single-player and Co-op test chambers within a simple in-game editor. In order to create a Co-operative puzzle, the chamber must be marked as a "Co-operative puzzle" in the "File" menu of the Puzzle Creator. O - Invert surface portalability. c+ - Duplicates an item (does not duplicate any connections). Tab ⇆ - Switch to game view. Rapidly duplicate puzzle items by holding down C while moving them. Create a pre-placed gel splat by deleting or disabling the associated dropper. As the puzzle creator is designed for ease of use, certain limitations apply. These limitations can be overcome by exporting the map to Hammer (see Related Commands). There is a limit of 1750 entities in a single chamber. Items consist of multiple entities, meaning the actual number of placeable items is much lower than this. The entity cost of each item is noted on its page. The editor is block based, meaning that angles and smaller geometry cannot be achieved without the use of partial block items from BEE2 (see below). Certain item placements are "invalid", and the chamber cannot be built or exported to Hammer while invalid item placements exist within it. Invalid placements will show an error indication until fixed. The puzzle creator had a cut feature called Budget. Budget is a limitation in creating. If it goes to 0, you can't make items anymore. It was replaced with Compile Error if there's too much items in the map. Modifications are addons that add custom content to the PeTI Puzzle Maker and/or styles. BEEmod, or Ben and August's Extended Editor, is a well-known modification for the PeTI which adds 10 extra items to the in-game palette, including High Energy Pellets and Autoportals. A download and more information about the mod can be found at https://portal2backstock.com/bee/. BEE2 is the second version of the BEEmod. BEE2 is a standalone app which allows the user to choose the items available on the palette from a wide range of custom items. It also includes Carl Kenner's Stylemod, allowing you to choose between styles such as 1950s and Overgrown. It can be downloaded at http://portal2backstock.com/bee2/, along with TeamSpen210's Addons. BEE2.4 is a new version of the BEE2 which has been completely rewritten in Python by TeamSpen210. It includes lots of new features including multiple game support, stylevars which can be used to configure the behavior of things, and many new compiler features. This new version is available on GitHub at https://github.com/BEEmod/BEE2.4, and the official Discord server can be found at https://discord.me/beemod. This is currently the only supported version, any bugs in the old BEE2 will not be fixed. The BEE2 allows the user to select from a wide range of Valve-made and custom test elements, such as the large version of the Aerial Faith Plate and warm light strips. It also allows you to select a style in which the chamber will be built (such as 1950s Old Aperture). In the BEE2.4, you can also choose the background music, what voice lines are present (if any), the skybox (used for fog in larger chambers and bottomless pits) and the entry/exit elevator videos, if the style supports them. For example, you could make your map in a 1970s Enrichment Sphere with bottomless pits and the Announcer talking to the player, while Die Cut Laser Dance plays in the background. 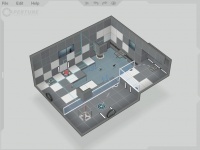 A bug in the Puzzle Creator which allows observation rooms to be placed on floors. An observation room in an invalid state. The message that appears when attempting to build a chamber containing errors. This page was last modified on 18 August 2018, at 14:01.